Pentair WhisperFlo Pumps give pool owners a powerful, efficient pump that will deliver all the water flow you will need on even the most demanding tasks while consuming less electricity than its competitors. The reason is its heavy duty square flange motor, which is able to provide all the power your pool needs to stay clean, clear and healthy. It features a durable composite casing that is highly corrosion-resistant as well as an oversized strainer basket to hold more debris, minimizing the need for cleaning. The WhisperFlo Pump will work on all cleaning systems, most filters, and even jet-action spas to ensure compatibility with virtually any pool, and is built to the high standards that Pentair demands of all its products, allowing you to buy with confidence. •Powerful square flange motors for outstanding performance and reliability. •Extra large strainer basket to hold more debris to minimize the need for cleaning. •Corrosion-proof thermoplastic housing to handle years of weather exposure. 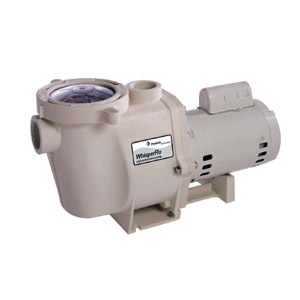 All WhisperFlo pumps are designed for use with 2" or larger plumbing for proper operation.